Widely accepted as the least polluting means of mass transportation, rail travel can justifiably lay claim to some pretty impressive green credentials at the outset. It has, for instance, been estimated that if the UK internal flights were to be made by train instead, by 2015 between 118,000 – 362,000 tonnes of carbon and 18,000 – 58,000 tonnes of nitrogen oxides emissions could be avoided. Even over relatively shorter distances than are commonly flown on domestic routes, a full train is at least twice as energy efficient as a full car – driving down the carbon cost per passenger mile and making a very clear case for rail as an eco-friendly travel option. The economics, at least at the moment, are stacked in favour of aviation – and most especially the budget airlines whose aggressive cost-cutting has made flying between many UK destinations significantly cheaper than travelling by the equivalent rail routes. However, many in the travel industry see this as an essentially unsustainable situation and untenable in the long run. With the growing eco-awareness in the travelling public more apparent with each passing week, rail is increasingly seen as the heir-apparent, waiting in the wings, to step into the gap this predicted decline in low-cost, short range flights will leave. 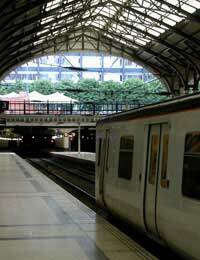 It is then, a strange irony that although the train has been something of an underused option for journeys overseas for many years, much of the credit for the current renaissance of rail must go to the Eurostar services to Paris and Brussels. Although it is less convenient for those of us living outside the south east of England, according to recent estimates, it is responsible for carrying over 70 per cent of Paris-bound traffic from London. Perhaps more importantly, it has re-kindled a dormant enthusiasm for cross-border trains – and the journeys do not all end at Paris. With the help of sites such as “The Man in Seat 61” travelling by rail from the UK to Europe and beyond has become a viable alternative to air travel which a growing number of people are now prepared to consider. Carrying relatively large numbers of passengers, at high speed and with fewer stops or hold-ups than cars or buses, rail travel is ideal for medium to long distances – particularly when there is a need to get somewhere quickly. Convenience coupled with economic and environmental issues do seem to be tipping the balance in favour of trains; a recent Barclaycard Business Travel Survey, showed that they are five times more popular with commuters today than they were just two years ago. It seems that the message is getting through. The headline-grabbing prices offered by low-cost airlines have helped to create a false idea of the relative costs of transport and eroded the distinction between long-distance international travel and short-haul or domestic flights. The “1p plus taxes” offers hide the reality that for city centre to city centre trips, railways often compete very effectively on speed, reliability, use of time and even quality. Despite shorter actual travel times, air is not the universally faster option when you factor in the time spent first getting to the airport, waiting to depart and then travelling to the final city centre destination. Aside of the direct reductions in airborne emissions, moving British domestic and European traffic onto rail would also free up airport capacity for longer-haul flights – an area where airlines do best – and help reduce the demand for more runways and associated infrastructure. In addition, the growing popularity of air travel appears to have struck at one of its own assumed key strengths – reliability. According to an independent report nearly 85 per cent of GNER trains arrived on time in the first seven months of 2004, compared with just over 77 per cent of flights on key Edinburgh, Newcastle and Leeds to London routes. While it will always remain true – at least for the foreseeable future – that some journeys are best made by car or plane, perhaps the most important benefit that rail travel offers is that it provides an alternative, where the choice of transport is not self-evident. The importance of this is increasing, as eco-consciousness grows and the taxation on other forms of transport rises – though it is often a little difficult to see which truly forms the greater influence! Whatever the reason, ever-growing numbers of people are at least considering the benefits of rail travel where previously they would simply have driven or flown – which can only be good news.